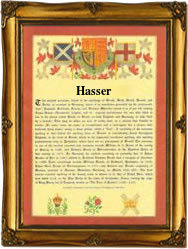 Recorded in the International Genealogical Index in an extra-ordinary number of spellings including Asser, Assire, Assur, Asyers, as well as Hassar, Haser, Hasser, Hayser, Hayzer, and possibly others, this is probably an English surname for most spellings, although there is some doubt. Certainly as shown below it has in some spellings been recorded in England since at least the reign of Queen Mary 1st of England known as "Bloody Mary", 1554 - 1558, and not to be confused with Mary, Queen of Scots, who was around at much the same time. We think that the original name was occupational, and a derivative of assay, a French word which as assayer, described an early chemist, one responsible for establishing the purity of metals, and specifically gold and silver. Early examples of recording showing the surname development over the centuries and taken from the surviving church registers of Greater London include Richard Asyers at Christ Church Greyfriars, on September 25th 1556, Richard Asser at St Andrews Enfield, Middlesex, on January 19th 1621, Elizabeth Hasser who married John Stephenson at St Dunstans Stepney, on March 11th 1666, John Hayser who married Alice Thackham at St Andrews Enfield, on August 21st 1715, and Charles Hayzer, christened at St. Dunstans Stepney, on October 8th 1848.